Feeling industrious, I decided to make use of a bunch of small quantities of leftover dried fruits. I don't normally make sweet stuff, but couldn't resist trying out and modifying a recipe I found on an Australian site for an apricot/fig/raisin loaf. This recipe owes a lot of its success to the base of the batter sitting in the fridge overnight. I added vegetable oil to make it really moist. Greg gave this one a double thumbs-up, so it made clearance for the blog! In a large food storage container, combine fruits, spices, flour and milk. Mix well. Cover and refrigerate overnight. Preheat oven to 350°. Grease a standard loaf pan. Remove the batter from the fridge and let it sit at room temperature for 20 minutes. Blend in the oil and baking powder, and let it sit another 5-10 minutes. Add half the almonds. Stir until just combined. Spoon mixture into prepared pan. Sprinkle with remaining almonds. Bake for 1 hour to 1 hour 15 minutes or until a toothpick inserted in the center comes out clean. Stand in pan for 5 minutes. Turn out onto a wire rack to cool (careful or the almonds on top will fly all over the kitchen! oops). Best when you cut this into thin slices (it is very rich), toast them and serve with butter. Unless you've been under a rock for the past few years, you're well aware of the massive locavore movement to live, sight-see, eat, shop, play, consume, grow, breathe and what-have-you anything local. It used to be just about food sourcing. But now, anything that's grown, designed, fabricated or pulled from the ground less than 100 miles away (ideally, a leisurely bike ride away) is hip. A decade ago, few people knew what CSA meant. Now it's common to overhear conversation about CSA shares or half-shares and the fab mushrooms and killer zucchini delivered last week. The more progressive we seem, the more we look to the past (think of your average medieval market town!). I've long been a fan of all things local because there's a certain pride of association with the great things we have right where we live. You might say I'm a localist (my made-up word) - an expansion of the locavore term. And we had a fantastic localist weekend in H'town. It started with dinner on Friday at REEF - one of our fave Gulf coast seafood spots courtesy of Bryan Caswell and Bill Floyd. It was my first experience with tile fish - I'm hooked! We all tried new things. Saturday brought about stunning weather, and everyone was out enjoying it. We hit Hermann Park to check out the fascinating Zodiac Heads exhibit by Ai Weiwei. These monsters weigh more than 800 pounds each! We topped off the day with visits to a few of the 100-plus galleries participating in the biennial Fotofest photography exhibit. Houston hosts the country's largest and oldest such exhibit; the theme for 2012 is Russian contemporary photography. Sunday delivered incredible weather again. And everyone came out again. With the temp in the 80s, it was a perfect day for playing in Discovery Green. And, for a stop in at the MKT Bar at Phoenicia. Love their fresh, house-made selections. Everything we did was fewer than five miles from our home. How cool is that? Vegas on a Company Dime! Greg had another business trip to Vegas, and while it will never be my first choice of destinations, I'm happy to have returned. In our initial negotiations I agreed to go based on the pool availability. And, as Murphy's Law would have it, the temperature was in the high 30s at night and generally 50s or 60s during the day. That's ok. It was still a getaway and I enjoyed watching the usual bead-wearing, yard of margarita toting, hazy-eyed tourists looking for the next drink and a good bargain (the former of which is plentiful, the latter much less so in this city these days). I got in a lot of walking, some working out and some awesome meals. As tawdry as the city is, there is still beauty to be found. Like the approach as you fly in. Or, as you walk through the airport which appropriately hints at the over-stimulation you'll encounter on the strip. The dancers who are astonishingly bendy. Retro-cool, like this old McDonald's. Sculptural art you see everywhere, like this lighting at St. Mark's Square at The Venetian. Over-the-top designs like this walkway. And a few authentic items, like this antique cash register brought from the UK which sits inside my fave pub, Nine Fine Irishmen. Funnily enough, that pub is always full of visitors from the UK. I thought they came to Vegas to get away from it all?? And, of course, the nightlife. The streets are heaving with every possible representation of humanity, and that's what makes it so exciting. But in the end, I was happy to head back to Houston (the fourth largest city in the US) for peace, quiet and affordable dining. Preheat the oven to 375 degrees F. Slice the peppers in half lengthwise (cut from stem to base). Using a spoon or a small paring knife if you prefer, scrape out and discard the core and seeds. Arrange the peppers in a glass baking dish with the hollow side face up. It's ok if they touch. Prepare onion, carrot, celery and garlic in a food processor (peel and chunk, then whiz through processor until it's coarse but not mushy). Saute, stirring, for 5 minutes in large pot over medium heat with a teaspoon of olive oil. Chop mushrooms in the processor or by hand, add to the pot and saute for 3 minutes. Turn off heat. Add spices, rice, beans (with their sauce if using ranch style, or rinsed if not), cilantro and one cup of the shredded cheese. If it's a bit dry, add a little water (you basically want the filling to steam inside the peppers). Fill the pepper halves with the mixture, packing it gently to compress it inside the peppers. Bake until the peppers smell yummy and are bubbling and darkening on top, 17-20 minutes. Sprinkle the remaining 1/4 cup of cheese over the peppers and continue baking until the cheese melts, about 2 minutes. Serve immediately, topped with sour cream (if desired). Van Roehling, a Texas man of German heritage, is our friend's Dad. He was formulating his own variations of barbeque sauces and rubs, experimenting with infusions from the smoker and trying bold spice combinations. His appreciative guests raved about his creations, encouraging him to begin selling his wares. And so he did. Let me say that, knowing and loving his daughter, we know that attention to detail and personal connection runs in the family. My favorite is the smoky/garlicky/savory Campfire Dust rub, and I like it so much that I call her 'my dealer' - it's that illegally good. I use this in everything from roasted potatoes to omelets to creamed spinach to marinade. The only thing I haven't tried is sprinkling it on ice cream - betcha it would be good on vanilla! May I suggest that you order your Van Roehling stuff before it's outlawed! 1: add ground turkey and halve the amount of rice and beans. 2: substitute quinoa for rice. 3: for paleo-friendly, use ground meat of choice, remove rice and beans, add tomato paste and water, and finely processed cauliflower. Picking peppers: When purchasing the bell peppers, remember what your spouse/partner/family likes. I totally forgot that Greg detests green peppers. Doh! But they were two thirds cheaper. It would be fun to do a mix of colors so people can choose their color. Greg digs pizza night. Ok - 'adores' is a more accurate verb. For me, the game is finding stuff in the fridge and pantry to use as toppings. In fact, the decision to have pizza is often contingent upon the discovery of said potential toppings. Here's a pic of a recent pizza, and I'd like to share the toppings with you because this worked really well. And of course for me, a drizzle of truffle oil. I always keep ingredients on hand to make the pizza sauce (tomato paste, Italian seasonings, garlic and onion powder, bay leaf, salt, pepper, sugar and water) and just do a store-bought crust. I discovered that putting the chopped tomatoes on the pizza after the sauce and before the cheese makes the pizza even nicer. When the fridge and pantry don't look so promising, I'll resort to frozen spinach or other frozen or canned veggies for toppings. I even eyed a can of water chestnuts recently until Greg made a small gagging noise. I wisely put it back. It should still be usable when I re-discover it two years from now. Do you put weird things on pizza? What unusual toppings do you like? Taking stock: chicken, that is. Our finicky dog has been eating a lot of roasted chicken lately. It's one of the only things he'll eat, in fact. Not one for wasting food, I've been setting aside the remaining bones after pulling all the meat off. Stock in process - note the browned chicken bone! It's so easy to make this stock and freeze it (in one-cup and two-cup containers) that I find myself making it pretty often. The shortcuts here are using the already roasted chickens, and not doing a lot of prep with the veggies such as peeling them. This stock adds a lot more flavor to recipes than the sodium-laden foil-wrapped cubes. You'll need are a large stock pot (I like the kind that is more tall than wide), large spoon and a large mesh sieve. I brown the chicken bones first because this creates a nice crust and flavor which is imparted into the broth. The caramelized bits created by the chicken are incorporated into the broth when you add the water. 1. Heat a couple teaspoons of olive oil in the stock pot over medium heat. Add in the chicken bones, and brown them on all sides. 4. Bring it to a boil, then turn it down to a simmer. Occasionally skim off any yucky looking stuff as you walk by over the next 5 or 6 hours. 5. Turn off the heat, let it cool for about 30 minutes (stir every few minutes to get it to cool more effectively). Strain in batches through the mesh sieve into a large bowl, pressing gently with the spoon on the veggies to get flavor and water out. If you want to make the stock as lean as possible, but the bowl in the fridge overnight so you can capture any fat on top the next day. Or, portion into containers and freeze. I probably go out for brunch twice a year. Some might say that's weird for a foodie who loves to hit restaurants. But for me, it just doesn't take priority. On a given Sunday, if I'm not traveling I'm usually focused on stuff like yoga and church and hanging out in my kitchen, engaging in slow food therapy. On a whim, Greg and I decided to brave a monsoon for brunch at Haven. Chef Randy Evans continues to win over new fans and sustain loyalists with his straightforward, fresher-than-fresh locally sourced food masterpieces. Greg and I fall into the latter category. Today the restaurant hosted a special event: a 'Family Style Fried Chicken Picnic' event featuring singer and guitarist Ian Moore (Randy said it had sold out quickly - when we heard Ian and smelled that 'come hither' fried chicken, we knew why!). Greg ordered green chicken enchiladas with fried egg, onion, crema, cilantro, queso fresco and cilantro rice. Suffice it to say it disappeared quickly and short of a surreptitious plate-licking, nary a lone crumble of queso fresco remained. Greg declared the sauce some of the best ever. 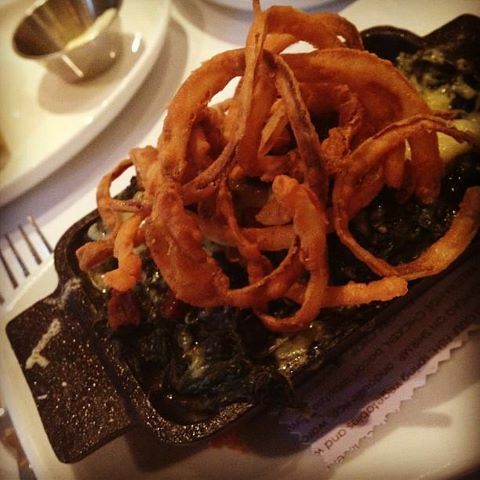 I ordered pan seared oysters with spinach, mushrooms, swiss, lardons, herbsaint and crispy onions. The oysters were plentiful, super-juicy, and balanced out by the lardons (like bacon but even better) and only a suggestive splash of herbsaint (an anise-flavored liquor from New Orleans). I loved the generous amount of spinach, and wasn't shy about piling it onto the wood-grilled sourdough slices. This little dish was packed with flavor, and oh so filling. 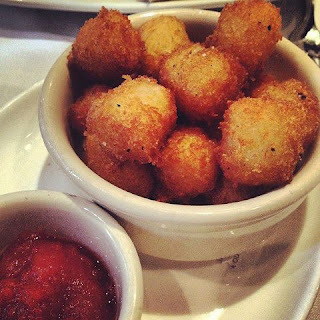 And...we shared a side of the famous "housemade" tater tots. Rude not to, right? I mean, we are in Texas, after all. These tots are crazy great. A satisfyingly savory crunchy golden outside protects a gratifyingly pillowy, airy and perfectly seasoned potato-ey inside. No shredded stuff here - just light, smooth elixir. And did I mention that killer gourmet condiment coyly sitting alongside? While it's made of charred, smoky tomatoes, the term 'ketchup' is rather too pedestrian a term to apply to this ambrosia. I would not suggest the above side dish for daily consumption, however. Haven describes itself as a seasonal kitchen. Having visited many times, I believe it is more of the perfect kitchen for all seasons. Pull up a chair, and expect to be delighted. You'll be glad you did. As a bonus, both Executive Chef and owner Randy Evans and Chef Philippe Gaston visited our table to say hello. Well played Haven, well played! Moderate the partying where possible (excessive eating, drinking, staying up all night...) - but of course still have fun! In short - yes, you can fit workouts into your vacation and not feel like it's a working vacation! Ah, T&T. Not the drink - the country. The side trip we took from Trinidad to Tobago was short, but oh so sweet. It's interesting to think of this country as inextricably linked islands. Trinidad, the southernmost Caribbean island is the country's principle land mass with 1,800 plus square miles, and neighboring Tobago is second in line with a compact 116 square miles. It's easy to see that most of Tobago was formed by volcanic activity, as the island boasts steep peaks of lush tropical vegetation dotted with tiny coastal shanty towns one accesses via stomach-churning squiggly byways and a white-knuckle ride. 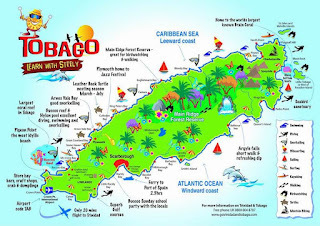 Tobago's recorded history stretches back to Columbus days. The island was inhabited by Island Caribs in 1580 when the Brits paid a visit, foreshadowing an eventual incorporation into the British Empire -- but not until after it changed hands more than 30 times. 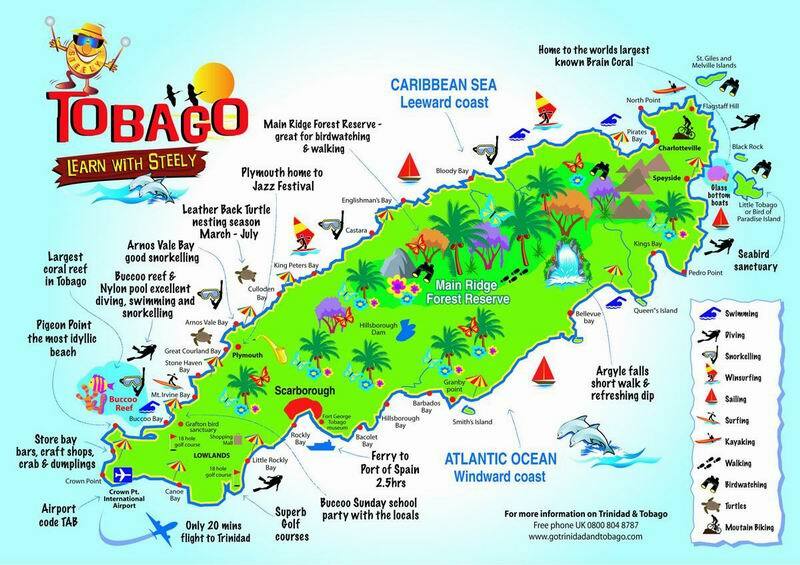 Tobago was united with Trinidad in 1889, then T&T became an independent commonwealth nation in 1962. Tobago is known for its pristine beaches, amazing diving, and ecotourism (its forests became a protected Crown reserve in 1776). It was the filming location for the Disney film Swiss Family Robinson. It's refreshingly non- commercialized. If you look at the map here, you'll see where the airport is on the southwest tip of the island. We stayed on the east side in Speyside at the recently renovated boutique Blue Waters Inn. We all loved the tranquil setting, the breathtaking views and the aquamarine beach. Poking out on the horizon were a series of wave-crashing jetties, and a home perched on a tiny island which is said to have once belonged to Ian Fleming (creator of James Bond and Chitty Chitty Bang Bang). A clay tile with crackled white front and edges worn soft by the sea landed in my hand with an incoming wave, and I dreamed this washed in from Mr. Fleming's home. Tobago is paradise, though I couldn't help but be struck by the obvious poverty despite an economy which should be quite rich considering the energy industry here. Government spending is the other principle driver of the economy and it does not look like much money makes it to the non-government workers. Ergo, lots of poverty. The optimist in me, however, embraces the utter simplicity of life here.